Provides a clear view of how the business and technology resources will support and achieve an organization's business goals and initiatives. Understand the strategy, the business, the systems and the infrastructure and how they interrelate. Moving "need to know" information to those that "know they need" upstream and down stream and in both directions. Helps Organizations prioritize and decide which things to do and in what order. "Doing the Right Things". EA governs the change and building of things. "Doing the Things Right". Executive input on strategic direction and priority. Business Manager input on process changes. Technology Manager input on supporting IT changes. Achieve strategic goals that depend on IT resources. Improve business performance by maximizing IT efficiency. Strategic priorities/business requirements drive IT solutions. Total visibility of multiple IT networks, systems, applications, services, and databases across the entire enterprise. Share information between lines of business. Reduce duplicative IT resources across the enterprise. Protect data and IT assets that rely on enterprise-wide approaches. Maximize the effective use of limited budgets. TOGAF : The Open Group Architecture Framework (TOGAF) is a framework and detailed method for building, maintaining, and gaining value from an enterprise architecture for an organization. The TOGAF specification is an open standard that has been created and is maintained by The Open Group (www.opengroup.org). 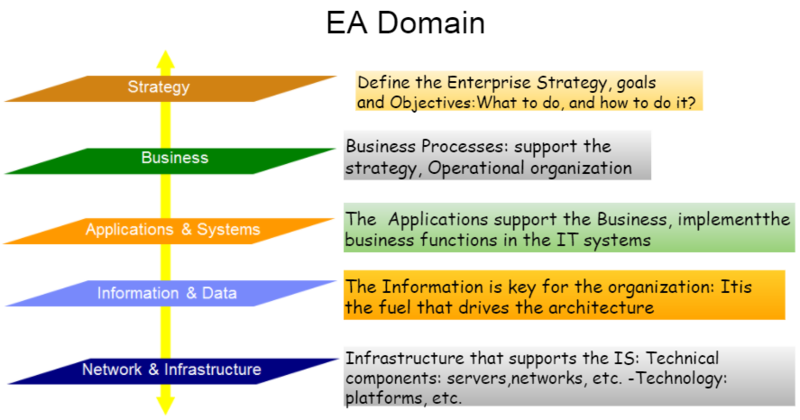 Business Architecture -- addresses the needs of users, planners, and business management. Data/Information Architecture -- addresses the needs of database designers, database administrators, and system engineers. Application (Systems) Architecture -- addresses the needs of system and software engineers. Information Technology (IT) Architecture -- addresses the needs of acquirers, operators, administrators, and managers. 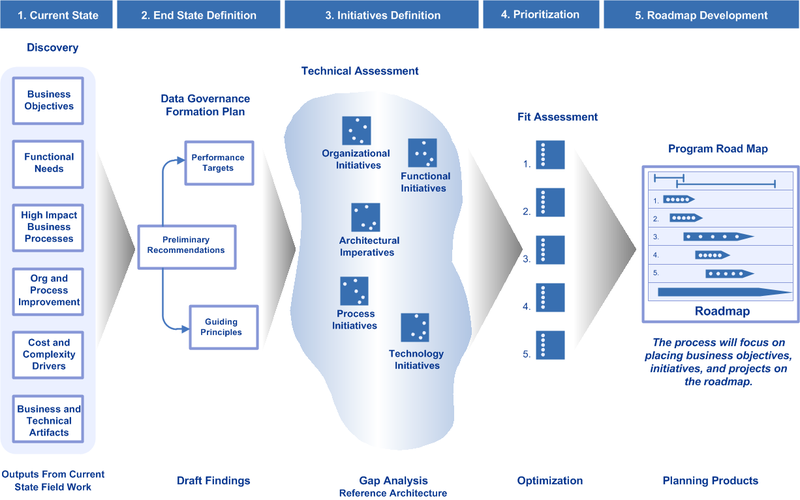 Architecture Development Method (ADM) :The core of TOGAF. A step-by-step approach to develop and use an enterprise architecture. Architecture Domain :The architectural area being considered. 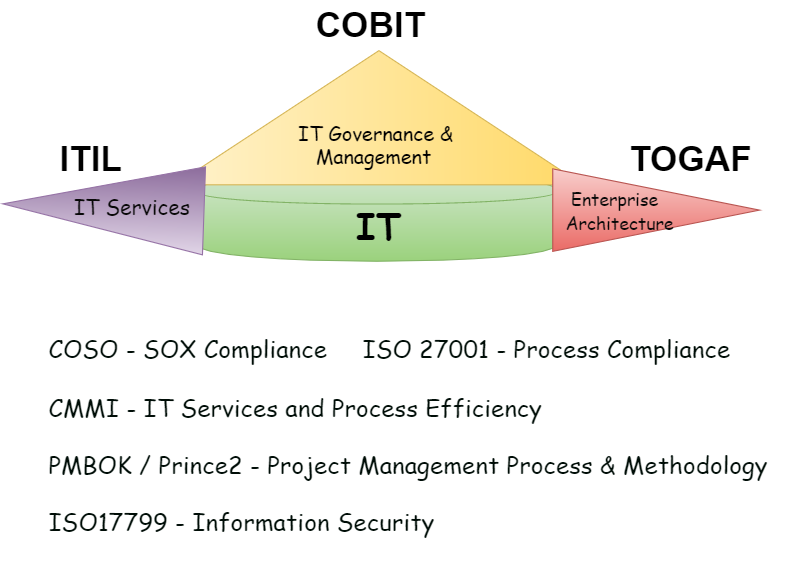 There are four architecture domains within TOGAF: Business, Data, Application, and Technology. Architecture Framework :A foundational structure, or set of structures, which can be used for developing a broad range of different architectures. It should contain a method for designing an information system in terms of a set of building blocks, and for showing how the building blocks fit together. It should contain a set of tools and provide a common vocabulary. It should also include a list of recommended standards and compliant products that can be used to implement the building blocks. Architecture View : A view is a representation of a system from the perspective of a related set of concerns. A view is what you see (or what a stakeholder sees). Views are specific. Architecture Viewpoint: where you are looking from; the vantage point or perspective. Viewpoints are generic. A model (or description) of the information contained in a view. Architecture Vision: A high-level, aspirational view of the Target Architecture. / A phase in the ADM which delivers understanding and definition of the Architecture Vision /Level of granularity of work to be done. Baseline: A specification that has been formally reviewed and agreed upon, that thereafter serves as the basis for further development or change and that can be changed only through formal change control procedures or a type of procedure such as configuration management. Baseline Architecture: The existing defined system architecture before entering a cycle of architecture review and redesign. Are you ready for Enterprise Architecture Transformation? The Market is Finally Ready for Business Architecture. Business Architecture is Transforming Enterprise Architecture. Customer pressures driving technological and organizational change in companies. EA transformation is necessary to maintain focus on the customer in today's digital world. Enterprises rethinking: How they serve customers , The role IT plays , How they build & manage teams and How they innovate ? Every line of business, department, functional area has its own requirements, its own way of doing things. Must invest in specialized components for narrow purposes. EA must integrate everything, increasing cost, complexity, & brittleness. EA challenges : Organizational silos , Application silos and Infrastructure silos It's Time to Take Down the Silos! Call us to find more details of what you can customize. 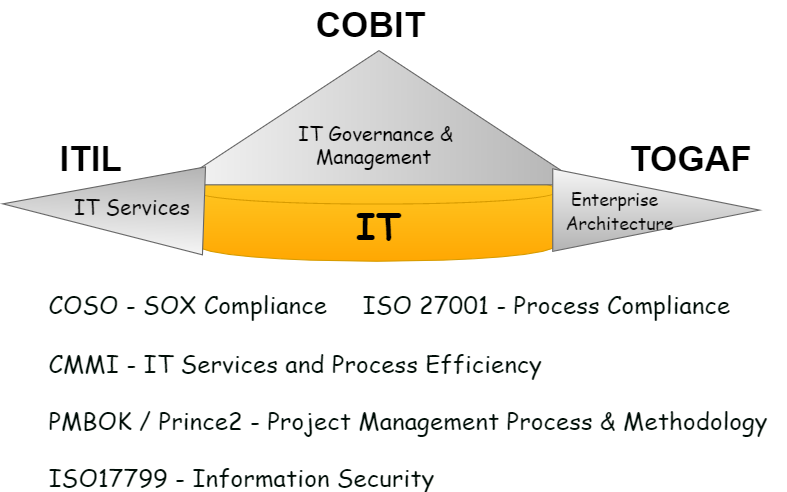 IT Governance is the process of decision-making and the process by which decisions are implemented (or not implemented) - directed and controlled. Is about executing the value proposition throughout the delivery cycle, ensuring that IT delivers the promised benefits against the strategy, concentrating on optimising costs and proving the intrinsic value of IT. Is about the optimal investment in, and the proper management of, critical IT resources: applications, information, infrastructure and people. Key issues relate to the optimisation of knowledge and infrastructure. Requires risk awareness by senior corporate officers, a clear understanding of the enterprise's appetite for risk, understanding of compliance requirements, transparency about the significant risks to the enterprise, and embedding of risk management responsibilities in the organisation. Tracks and monitors strategy implementation, project completion, resource usage, process performance and service delivery, using, for example, balanced scorecards that translate strategy into action to achieve goals measurable beyond conventional accounting. 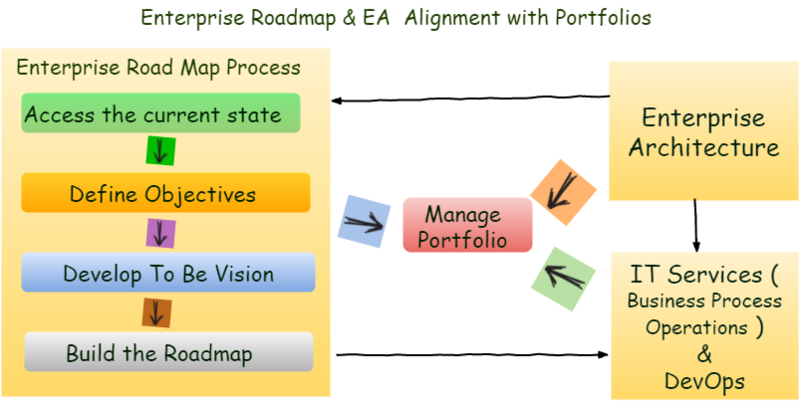 EA is a journey, often non-linear.Enterprise Architecture has to be treated as an ongoing program that continues to evolve together with the organization. Roadmap: A map which plots the way forward from where we are now to where we want to get. It keeps us on track to ensure that we do not get lost on route. It highlights obstacles and proposes ways of getting around them. It is useful when we need to respond to rapid changes resulting from either the business environment or a new technology. Information gaps can be addressed through a "Roadmap process".